the importance of embedding what has been learnt to ensure maximum effect. However it rarely if at all happens . The reason is a simple one, time and money. Booking locations, accommodation, travel time off work all add up. In a perfect world service professionals would return three or four times a year for a refresher course. Our solution is a simple one if service professionals can’t come for training we will send the training to them no matter where in the world they might be. So how do we do it? What is the WorldHost Customer Service Course? The WorldHost Principles of Customer Service programme will give your staff the skills and knowledge to deliver excellent customer service that will give your business a great reputation. Why a WorldHost embedded learning course? Anyone involved in training will tell you that it’s what happens after the training day that is important. Moving skills from short term memory to long term memory has always been a problem. Embedding the learning solves this problem but is difficult to achieve due to the cost and time off work. What is the WorldHost embedded learning course? Imagine talking the WorldHost customer service course and turning it into bite sized chunks of learning that is sent to every student once a month for a year. It is all in video, accessible 24 / 7 and available on tablets, smart phones and PC’s anywhere in the world. In short its training that comes to you so you don’t have to go to it. Who is the WorldHost embedded learning course for? To benefit from this course you should already have attended the one day WorldHost customer service course. The course is written and presented by a WorldHost qualified presenter and a team of young actors. Knowledge checks after each lesson ensure students are really learning. 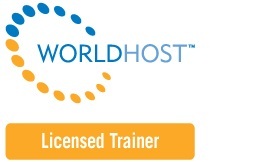 The WorldHost lite embedded learning course if for service professionals that have taken the one day WorldHost course. Each month you will receive bite sized chunks of learning all in video that can be taken on any smart phone, tablet or PC. This will remind and embed the learning you already invested in. The WorldHost advanced embedded learning course is for service professionals that have taken the one day WorldHost course. Each month you will receive bite sized chunks of learning all in video that can be taken on any smart phone, tablet or PC. The advanced course adds to the original learning in the form of two extra lessons per course.